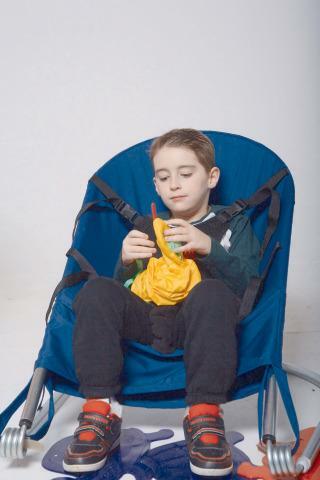 Our comfortable, sturdy Bouncing Chair is available in three sizes and designed for children up to 65 lbs. 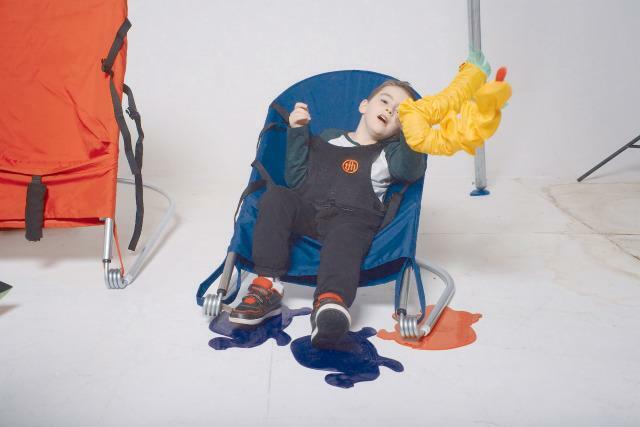 The perpetual motion provides Vestibular and Proprioceptive input for children with a range of Sensory Processing Disorders. 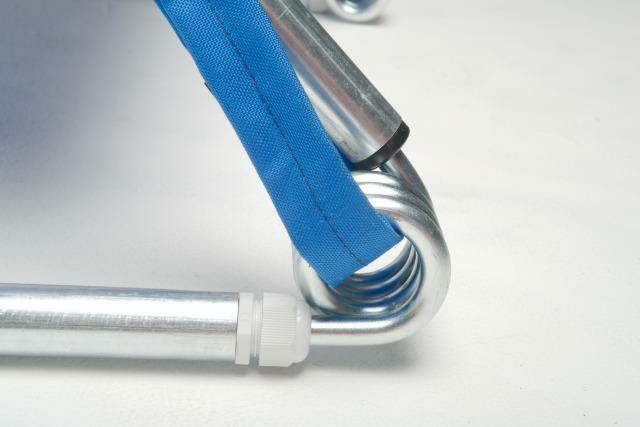 Comes with the Deluxe Harness. 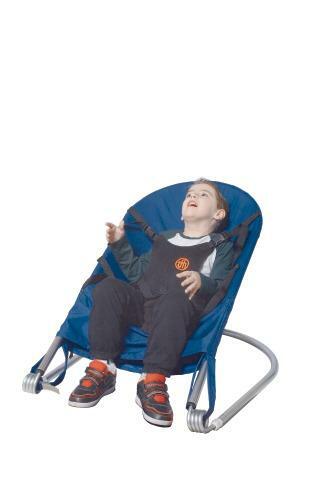 We have three sizes to choose from: Bouncing Chair Light - Weight limit 30-40 lb. 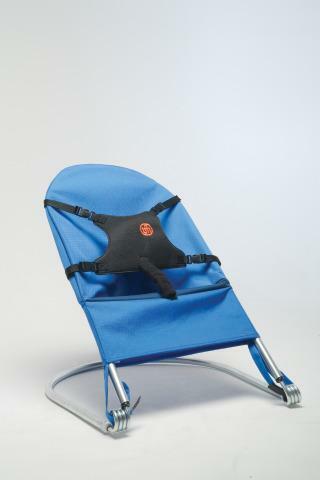 H: 23.5" (seat to top of chair) x W: 19.5" x Depth of seat: 6.25" Bouncing Chair Standard - Weight limit 40-50 lb. 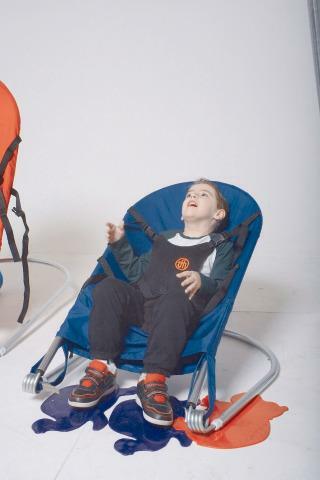 H: 23.5" (seat to top of chair) x W: 19.5" x Depth of seat: 8.25" Bouncing Chair Large - Weight limit 55-65 lb. 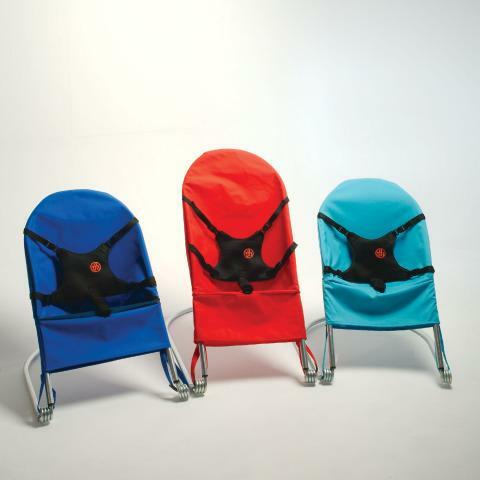 H: 32" (seat to top of chair) x W: 20" x Depth of seat: 11" THE BOUNCING CHAIR LARGE IS ON BACK ORDER UNTIL MID-MARCH. The order processing was quick and easy. The product seems high quality. My son enjoys it but slides off the seat part. If it had a little more structure to it I think it might work better for us. Also I wish it had grippers for the floor part so it didn't slide so much when he gets going. Love it! My daughter had just outgrown the big one she had loved so much! This is perfect! The chair overall is a great purchase. we will use it everyday and my daughter loves it. I was so glad to find a chair that will accommodate her size. 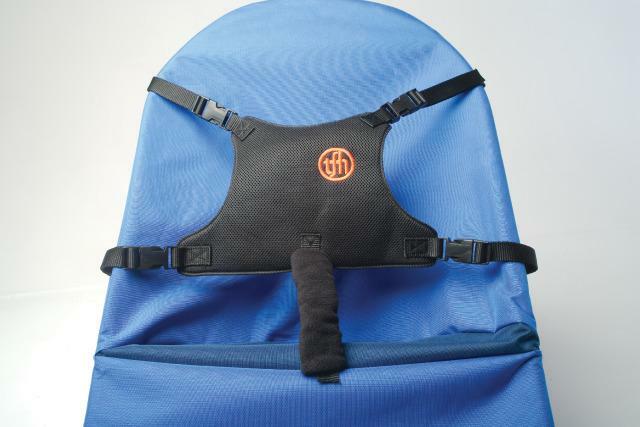 I would have loved to have a deeper seat since she does not have a lot of muscle tone and the straps stretch across the frame, not around the person from the fabric. she tries to escape through the straps but as long as I watch her, she has a great time. Good chair, quite hard to put together needs two people. Not sure if a large 6yr old would last long and our 2yr old is nearly touching the floor when he bounces. This is our 4th chair in the past two years. My small 11 year old daughter uses is daily. She can not bounce in it independently, but we can bounce her. I wish it was possible to just purchase a slip cover replacement for this chair since we have replaced the chair three times already. The stitching keeps coming apart where the seat is and also where the harness is attached. Such a great concept! Wish they also made one for the next weight up 50 - 80 lbs! The chair is easy enough to put together and is nice looking all in all. 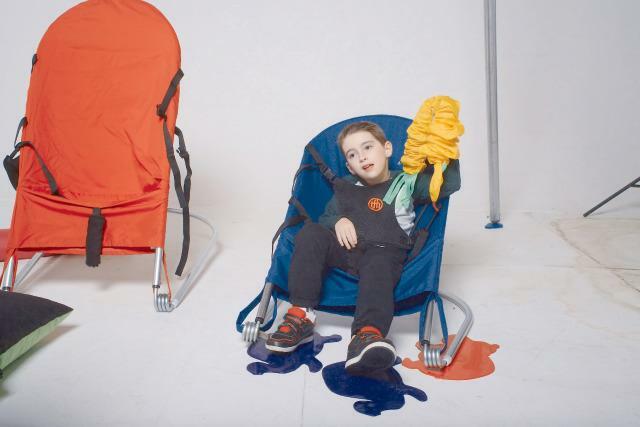 My son's feet don't touch the ground when he sits in it so bouncing is not as easy for him, and by the time he grows tall enough the back will be too short- seems like a design flaw- maybe adding a foot rest to the design would be wise. We are keeping it because it's light enough to move around the house, and there isn't anything else I know of like it on the market. My son loves it! 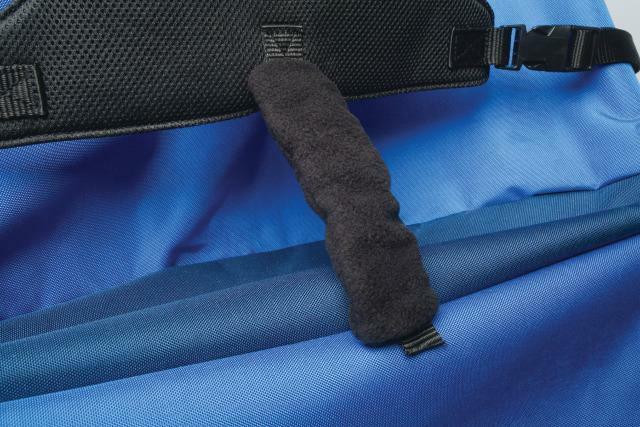 Some issues with the fabric seperating but after emailing customer service they are sending out a new cover. 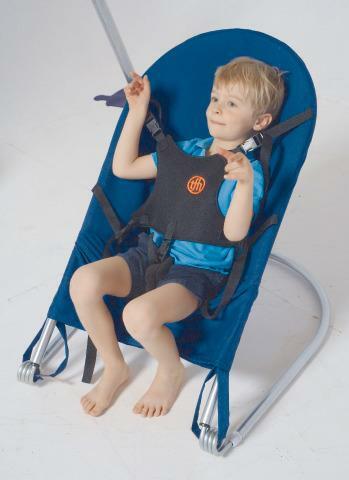 For a child who can not sit unassisted and is loaded with energy this bouncy chair is great! I call it my sons workout (even though he's tiny) because it helps him release all that energy that use to frustrate him to the point of screaming and grunting. Good price, good design, and perfect size. The chair was purchased for my daughter who finds it comfortable and very relaxing. My only concern is that of putting the chair together. The placing of silicone tubes onto the metal rods is far from easy infact by the time I got them on my hands were very sore and even bruised. Love the bouncy chair and very easy to assemble. But if your kid is taller than about 50 inches their head may hang off the back or hit the bar.